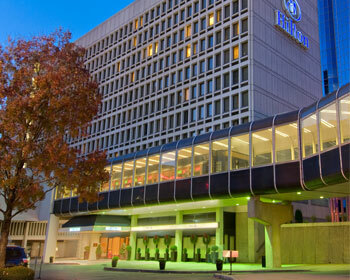 Parking.com has convenient parking for guests of the Hilton Newark Penn Station Hotel. For more information on nearby parking, click on the map shown. Daily rates are available at selected locations. The Hilton Newark Penn Station Hotel is conveniently located adjacent to Newark's Penn Station where guests can catch Amtrak, NJ Transit, Newark Light Rail trains and bus services. Within a short walking distance from the hotel are many popular restaurants and the Prudential Center.